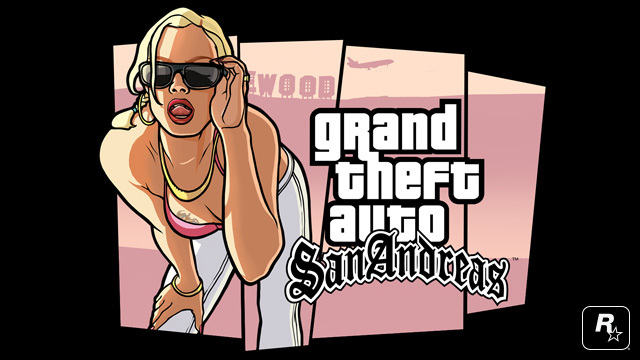 Before GTAV took us to the sun-bleached sidewalks and humming concrete freeways of present-day Los Santos and beyond, there was Grand Theft Auto: San Andreas, the biggest GTA of the PS2 era. Now, head back to the early 90s with CJ and the Grove Street Families when Grand Theft Auto: San Andreas comes to mobile devices next month. Encompassing Los Santos, San Fierro, Las Venturas and everything in between, Grand Theft Auto: San Andreas has been upgraded for its mobile release. Newly remastered graphics including dynamic and detailed shadows, greater draw distance, an enriched color palette, plus enhanced character and car models make this the best-looking version of San Andreas yet. Grand Theft Auto: San Andreas also features brand new touch controls including contextual control options to display buttons only when you need them and three different control schemes for driving and maneuvering, as well as a reworked checkpoint system for easier progression. Grand Theft Auto: San Andreas for mobile also comes equipped with full controller support, including Made for iOS controller capability on iOS7. It will be available for select iOS, Android, Amazon Kindle and Windows Mobile devices. Stay tuned for more details in the weeks ahead. The post was edited 1 time, last by ρυηιѕнєя ( Nov 27th 2013, 5:50pm ). When it will be out on iphone? Does it include SA-MP as well? "A true friend is a friend which will always help you at needed time"
"Don't ever give up on something you really dream to do and u will see that u will succeed"
Dont know Much about forum Click here!! Great, hope there will be a multiplayer modification as well.. If you are mapper and you have nice minigame (Race/DD/Shooter/CTF/BG/SADM) or freeroam maps for our server, please contact me by sending a Private Message on forum. I think that Rockstar Games have more than one Team, maybe another Team is already working on GTA V for PC? Maybe not, who knows. It will come next Month (December) and I don't think that it will include SA:MP because Rockstar Games has nothing todo with SA:MP.